Photo: demoshelsinki. Creative Commons BY-NC-SA 2.0 (cropped). Planet Earth is becoming hyperconnected. This transformation is called the Internet of Things, Connected Devices, Programmable World, and many other names. As a result, we are at a major crossroads. What are the conditions under which this change becomes the guiding development of our time? 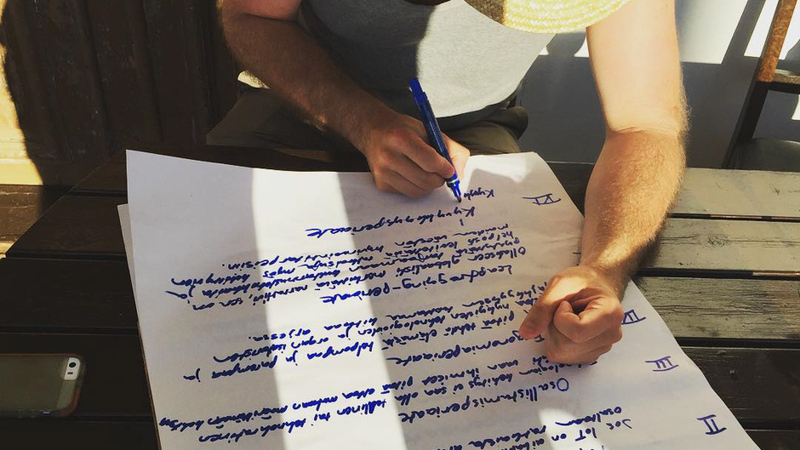 How can we support positive change and use technology to create a better world? Demos Helsinki has identified 10 principles to guide development towards a hyperconnected, sustainable planet. Our claim is that if these principles are not followed, our hyperconnected planet will have a more dystopian than utopian future. We’re using the principles to construct an index for comparing nations, cities, and companies, and providing them with recommendations about how to do this correctly. In order for hyperconnectedness to be a truly significant development, it has to play its part in solving the grand challenges of our times — It must solve bigger problems than it causes. Currently, human development is tied to increased resource consumption. Decoupling this correlation is one of humanity’s biggest challenges. In order to ensure social in all parts of the world, disconnection of material and energy usage needs to be achieved. The Parity principle is not only an opportunity, but also an imperative. Technological progress often provides applications and things that are nice to have, but it doesn’t always solve concrete and significant societal challenges. However, we’re currently living through a transition. More and more people are looking for substantive solutions instead of mobile games. Many of the pioneers of the digital era, such as Elon Musk, are calling for grand solutions. Mechanisms and actors such as the Founders’ Fund and the Singularity University are emerging to support initiatives that provide concrete solutions through technological innovation. However, the Parity principle doesn’t only apply to technological innovations. It also implies a wider paradigm shift in which hyperconnectedness should initiate solutions for the world’s problems instead of gimmicks and insignificant applications. These two approaches depict alternative routes through which hyperconnectedness can help to decouple the correlation between human development and ecological consumption. Progress can be measured through the slope between the Human Developmen Index (HDI) and the ecological footprint. 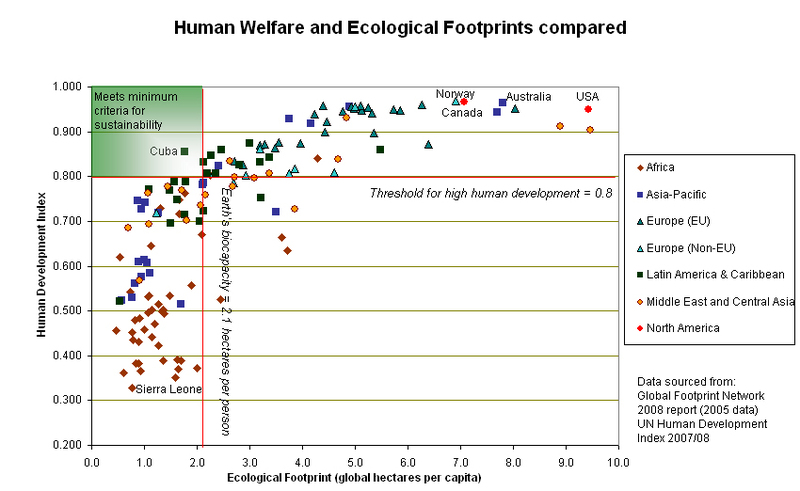 Currently, a correlation exists between human development index and ecological footprint. Photo: Kia Ora. Creative Commons BY-SA 3.0 (cropped). Hyperconnectedness needs to solve more problems than it creates. Technological development creates both problems and solutions. Often, in the end, the solutions just tackle problems that a development has played a part in creating. However, the development might create more problems than solutions. Possible problems caused by hyperconnected are for example privacy issues, monopolization of markets and increase energy use. Nevertheless, a hyperconnected planet needs to provide utility instead of just technology for technology’s sake. Technologies should be designed and developed by and with the people who use them. Technological development shouldn’t just be an industrial or technocratic project. Users should be involved in defining the direction of the development. This is a more effective way to maximize benefits. The proven effectiveness of public participation challenges the logic of centralized hierarchies, advances the notion that many heads are better than one, and argues that the participatory approach to business, innovation, and public policy should be the norm. In broad terms, this requires a shift from companies to communities. The main difference between a company and a community is that while companies share a goal, communities share a resource. Thus, the Encyclopedia Britannica cannot measure up to Wikipedia. Technologies should be designed and developed for the users. The hyperconnected planet should make life easier and better, and at the same time remove current problems by using technologies. Ergonomy is the study of making things work with minimal discomfort and burdens to users. It is the art of making things as useful as possible, with the least possible worry for the user. A design-thinking approach to technology development broadens ergonomic thinking to also be about “what” to do instead of just “how” to do it. It also enlarges the development horizon to involve not just single items and processes, but goals, organizations, and systems. When people–users, citizens, customers–are involved in the design process, the required changes for achieving a better life become obvious. For the hyperconnected planet to be a globally relevant narrative, it should also offer cost-effectiveness and easily spreadable solutions for the needs of people in developing countries. There is 3G cell service and Internet capability at the peak of Mt. Everest, but as of 2012, only 9% of Nepalese people used the Internet. While technology costs are going down, the affordability and accessibility of new technologies is not guaranteed all over the world. This is especially the case if declining technology prices don’t reach users due to monopolies or there not being the political will to increase capabilities quickly. Even if this is not without challenges, companies in more developed countries should seek opportunities to provide services in countries where there are no healthy, home-grown industries. It is important to reap benefits from new value creation in addition to increased productivity. The change should not only be an improvement but also a source of radical new value creation. A radical technology creates new sources of value. Even though hyperconnected technologies can and should create more value from old markets, the truly interesting opportunities are in the markets where there has been no previous value creation via technology. Examples of Vanilla markets include sensors in forests (in a pilot project, Microsoft Research used sensors to track down illegal forestry in rainforests) and leapfrogging possibilities through adding connectivity to a rural area. Vanilla markets also exist in cities and homes. For example, using smart technologies, it’s possible to use the enthalpies in wastewater to improve district heating in smart cities. The development of the hyperconnected planet should, by definition, save more natural resources than it consumes. Humanity is far exceeding the planetary limits of consumption. Thus, ecological assets are becoming more and more critical. Many countries are running ecological deficits, with ecological footprints much larger than their own biological capacity; many other countries are heavily dependent on resources from elsewhere. The hyperconnected planet is an impossible development if it creates this burden. Data, connectivity, programmability, and sensors offer huge benefits, but only if they are able to harvest their own energy in some way from abundant energy sources. As a development, the hyperconnected planet is blind without cultural context. Culture without technologies is barren. For technological planetarism to be significant, it has to connect on a cultural level. Social and cultural progress facilitate the use and applicability of technologies. One instance of this is language. For effectiveness, we need enough diversity in vocabulary to support new initiatives and collaborations that enable the use of technological planetarism. This drives innovation and progress. The advent of dominant market position, monopolies, and oligopolies should be prevented both globally and locally. In 2013, Google went down for five minutes, and in that time, the global Internet traffic dropped by 40%. It is becoming apparent that digitalization creates new natural monopolies. There are several reasons for this. First, some digital business models are so innovative that they overwhelm existing regulatory mechanisms, in terms of both legislation and historical jurisprudence. Second, some markets are by their nature monopolized: someone always has the best search or the widest selection of houses to rent. The preference for picking these monopolized markets is not just decided by governments, but by groups of people. Because all the people are networked, artificial sub-networks–for example, of friendship or reputation, or for money transfers–are always less tempting than monopolies. Laws and regulations are needed to enable agile, well-functioning markets. The risks of data ownership and privacy need to be avoided, and rights need to be secured. In 2010, Finland became the first country in the world to make Internet access a legal right. Now, there are plans to make access to a 100 Mbit/s Internet a legal right for all citizens. Back in 1982, France gave every household a computer to connect to an early version of the Internet to avoid printing telephone books. At the same time, when all prisoners in Norway have Internet in their cells, Sweden warrantlessly wiretaps all telephone and Internet traffic that crosses its borders. Our actions create us. Everything we do builds our identity. But when all of our actions are recorded, we lose the possibility to rebuild. In the digital world, where we lack access and control, our actions don’t communicate what we think we are and what we want to be. Rather, they define who we are and who we will become. Our identity becomes solid instead of fluid. Privacy is a human right. People should have control over and access to the data they produce. If this right is not granted, people give significant power to those who have the access to and control over information. Even though they might be trusted now, no one can predict who will have the access and control in the future. Data about you is a leverage point for predicting and influencing your future actions. It is power over you. On the other hand, information about someone else can also function as leverage. In some cities, police officers are required to wear a camera in order to document their interactions with civilians. In these areas, public complaints against officers have dropped by an average of 88%. Do you agree with these principles? Is something missing or misunderstood? Please comment! Demos Helsinki is using the principles to construct an index for comparing nations, cities, and companies, and provide recommendations about how to do this correctly. This post, originally published on Demos Helsinki’s blog, appears here with permission. 10 Nordic Principles for a Hyperconnected Planet by Johannes Koponen is licensed under a Creative Commons Attribution 4.0 International License. Permissions beyond the scope of this license may be available at Demos Helsinki. Johannes Koponen is researcher and Head of Foresight at Demos Helsinki. The core of Johannes’ expertise lies in strategic futures studies and development of business models through the scenario method and other futures studies methods. Johannes holds a M.Sc. (Tech.) from knowledge intensive business major at Aalto University. He also has a broad understanding in communication and media research, and is currently working on his PhD at the University of Helsinki Faculty of Communication. In addition he teaches futures studies in the Aalto University and Open University. Johannes is the co-founder and current CEO of Scoopinion that won the biggest Nordic media innovation award in 2011. In 2013, his project Herring, a computer game used to aid children’s hearing tests in three Finnish university hospitals, won a major healthcare gamification award.